The Palatine Gate (Italian: Porta Palatina or Porte Palatine; Piedmontese: Tor Roman-e) is a Roman Age city gate located in Turin, Italy. The gate provided access through the city walls of Julia Augusta Taurinorum (modern Turin) from the North side and, as a result, it constituted the Porta Principalis Dextra (Right-Side Main Gate) of the old town. The Palatine Gate represents the primary archaeological evidence of the city's Roman phase, and is one of the best preserved 1st-century BC Roman gateways in the world. Together with the ancient theatre's remains, located a short distance away, it is part of the so-called Archaeological Park, opened in 2006. The name Porta Palatina literally refers to a palazzo (palace) placed near the gate, but it is not clear what palace is here referred to. The most trusted theory suggests that it might be either the former Casa del Senato (House of the Senate), a medieval palace located very close to the Palatine Gate, inside the city walls, or perhaps the Palazzo di Città (City Palace), the city hall of Turin placed not far from the gate as well (though a little farther than the old House of the Senate). A second theory hints to the presence of an alleged adjacent amphitheatre built near present-day Borgo Dora, a historical neighbourhood developing right outside the old city walls (north of the Porta Palatina). This facility might rapidly have fallen into disrepair and, as a result, it might simply have been dubbed palazzo by the ancients. Over the centuries, however, the Palatine Gate was also known by some other names, such as Porta Comitale (Count's Gate, allegedly referring to a count's residence), Porta Doranea or Porta Doranica (since it led to the Dora river) and later as Porta Palazzo (a clear synonym of Porta Palatina). The Porta Principalis Dextra served as an access to the cardo maximus, currently identified in Via Porta Palatina and Via San Tommaso. 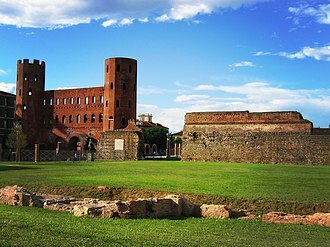 Its impressive remains are currently visible at the center of an open area, today's Piazza Cesare Augusto. Quite similar to the ancient Porta Decumana, built into the medieval structure of the present-day Palazzo Madama, the Palatine Gate represents an example of a typical Roman gate facing a cavaedium (quadrangular courtyard on the inside of the city walls), the remains of which are placed in front of the gate. Erected on a square base, the two angular towers are more than thirty metres high and feature a sixteen-sided structure. The central body, namely the interturrio, is about twenty metres long and is characterized by two orders of windows, the lower one composed of arch windows and the upper one made up of jack arch windows. The underlying portion features four entryways: the central ones are larger and taller and are vehicle accessible, while the two entryways to the sides are narrower and shorter and served as pedestrian passageways. The grooves along the entryways' inner walls suggest the original presence of the so-called cateractae, an alleged system of gate gratings operated from the upper floor. On the ground near the gate is still part of the guardhouse added in the Roman period, on which one can see the furrows on the stones caused by the transit of wagons. The pair of bronze statues depicting Augustus Caesar and Julius Caesar are not the original statues but copies from the last, radical restoration of 1934. However, they are object of discussion as they were incorrectly placed in the internal area occupied by the statio and not outside the gate, where they would possibly have more relevance. Built in the 1st century during the Augustan Age or the Flavian Age, the Porta Principalis Dextra may predate the construction of the city walls and was perhaps built on the location of an earlier Republican Age gate. This facility served as a city gate for a long time and was turned into a castrum in the 11th century, although it lost the internal structure of the cavaedium over the centuries. In 1404, after centuries of incursions and partial decay, the western tower was rebuilt and both towers got completed with battlements for defensive purposes. The Palatine Gate was supposed to be torn down in the early 18th century, pursuant to the urban renewal process started by Vittorio Amedeo II. However, the dismantling was not implemented thanks to the intervention of the architect and engineer Antonio Bertola, who convinced the duke to preserve the ancient architectural work. In 2006 the City of Turin started a restoration of the archaeological area, with the intent to improve the park, make the towers accessible to the public and build an underground parking for the carts of the nearby Porta Palazzo open market. ^ This palace is thought to have hosted some notable historical figures, such as Charlemagne (in 773), Charles the Bald, Lothair (in 947) and Frederick Barbarossa. However, we have no documentation confirming these events with certainty. ^ The presence of an amphitheatre is suggested by the particular conformation of the nearby Via Borgo Dora, which features an elliptical track that could be the residual evidence of a circus. ^ Commentari dell'Ateneo di Brescia. Ateneo di Brescia. 1828. Retrieved 20 December 2014. ^ Craveri, Giovanni Gaspare (1753). Guida de' forestieri per la real città di Torino. 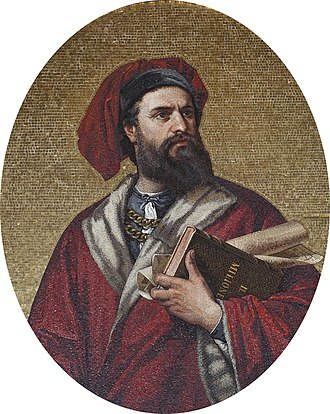 Gian Domenico Rameletti. Retrieved 20 December 2014. ^ To this day, the name Porta Palazzo lives on in the nearby mercato di Porta Palazzo, the historical open market of the neighbourhood which is also the biggest one of its kind in Europe. ^ Small traces of a statio are left to testify the presence of the cavaedium, which was about twelve yards wide as we can assume nowadays. ^ Surveys carried out between 1936 and 1938 revealed the remnants of structures that lead to assume the presence of an earlier Republican Age gate. Torricella, Giuseppe - Torino e le sue vie, Turin, Le Livre Précieux, 1971. Cardoza, A. e Symcox, G. - Storia di Torino, Turin, Einaudi, 2006. Luisa Papotti, La Porta Palatina. L'intervento di restauro degli anni novanta, in Liliana Mercando (a cura di), Archeologia a Torino. Dall'età preromana all'Alto Medioevo, Umberto Allemandi & C., Turin, 2003, pp. 89-96. Claudio Franzoni, Le mura di Torino: riuso e "potenza delle tradizioni", in Enrico Castelnuovo (a cura di), Torino. Prima capitale d'Italia, I luoghi dell'arte, Istituto della Enciclopedia Italiana Treccani, Rome, 2010, pp. 13-22. Gruppo Archeologico Torinese, Guida archeologica di Torino, Turin, p. 102. Politecnico di Torino Dipartimento Casa-Città, Beni culturali ambientali nel Comune di Torino, Società degli Ingegneri e degli Architetti in Torino, Torino 1984, p. 286. Wikimedia Commons has media related to Porta Palatina (Turin). Frederick I, known as Frederick Barbarossa, was the Holy Roman Emperor from 1155 until his death. 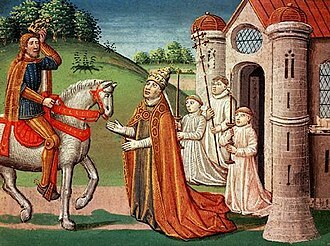 He was elected King of Germany at Frankfurt on 4 March 1152 and he became King of Italy in 1155 and was crowned Roman Emperor by Pope Adrian IV on 18 June 1155. 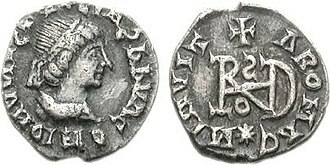 Two years later, the term sacrum first appeared in a document in connection with his Empire and he was formally crowned King of Burgundy, at Arles on 30 June 1178. He was named Barbarossa by the northern Italian cities which he attempted to rule, Barbarossa means red beard in Italian, in German, he was known as Kaiser Rotbart, before his imperial election, Frederick was by inheritance Duke of Swabia. He was the son of Duke Frederick II of the Hohenstaufen dynasty and Judith, daughter of Henry IX, Duke of Bavaria, Frederick therefore descended from the two leading families in Germany, making him an acceptable choice for the Empires prince-electors. Historians consider him among the Holy Roman Empires greatest medieval emperors, in 1147 he became Duke of the southern German region of Swabia, and shortly afterwards made his first trip to the East, accompanied by his uncle, the German king Conrad III, on the Second Crusade. The expedition proved to be a disaster, but Frederick distinguished himself, when Conrad died in February 1152, only Frederick and the prince-bishop of Bamberg were at his deathbed. Frederick energetically pursued the crown and at Frankfurt on 4 March 1152 the kingdoms princely electors designated him as the next German king and he was crowned King of the Romans at Aachen several days later, on 9 March 1152. Fredericks father was from the Hohenstaufen family, and his mother was from the Welf family, the Hohenstaufens were often called Ghibellines, which derives from the Italianized name for Waiblingen castle, the family seat in Swabia, the Welfs, in a similar Italianization, were called Guelfs. 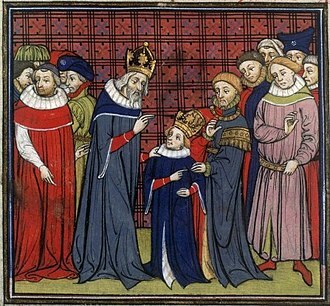 The reigns of Henry IV and Henry V left the status of the German empire in disarray, for a quarter of a century following the death of Henry V in 1125, the German monarchy was largely a nominal title with no real power. The king was chosen by the princes, was given no resources outside those of his own duchy, the royal title was furthermore passed from one family to another to preclude the development of any dynastic interest in the German crown. The Basilica of Superga is a church in the vicinity of Turin. It was built from 1717 to 1731 for Victor Amadeus II of Savoy, designed by Filippo Juvarra and this fulfilled a vow the duke had made during the Battle of Turin, after defeating the besieging French army within the War of the Spanish Succession. The architect alluded to earlier styles while adding a baroque touch, the church contains the tombs of many princes and kings of the House of Savoy, including the Monument to Carlo Emanuele III by Ignazio Collino and his brother Filippo. Under the church are the tombs of the Savoy family, including most of its members and this church by Juvarra is considered late Baroque-Classicism. The dome was completed in 1726 and resembles some elements of Michelangelos dome at St. Peters Basilica and this is no coincidence as Juvarra studied and worked in Rome for ten years prior to working in Turin. The temple front protrudes from a dome structure citing the Pantheon, the temple front is larger than typical proportions because the Superga is set upon this hill. It is believed that Victor Amadeus wanted the basilica to rest on this hill as reminder of the power of the Savoy family as well as continue a line of sight to the castle in Rivolli. Later, the Stupinigi completed the triangle between the three residences of Savoy, the Royal Crypt of Superga is the burial place of the Savoy family. Victor Amadeus, having knelt down in front of an old prop, swore that, in case of victory, from dawn until the early hours of the afternoon of September 7 the armies clashed in the fields at Jaya and Madonna di Campagna. Piedmontese armies achieved victory over the French, the entrance of the basilica with its portico supported by eight columns. Vittorio Amedeo was crowned King of Sicily and he entrusted the design of this building to Filippo Juvarra. The mountain at which the Basilica is found was the site of the Superga air disaster of Grande Torino football team in 1949. The Royal crypt is the burial place of members of the House of Savoy, successively Dukes of Savoy, Kings of Sardinia. In the Roman Empire, the Latin word castrum was a building, or plot of land, used as a fortified military camp. Castrum was the used for different sizes of camps including a large legionary fortress, smaller auxiliary forts, temporary encampments. 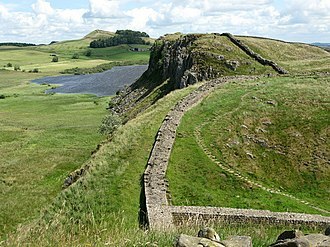 The diminutive form castellum was used for fortlets, typically occupied by a detachment of a cohort or a century, in English, the terms Roman fortress, Roman fort and Roman camp are commonly used for castrum. However, scholastic convention tends toward the use of the camp, marching camp. For a list of known castra see List of castra, the term castrum appears in three Italic languages, Oscan and Latin. g. Castrum Album, Castrum Inui, Castrum Novum, Castrum Truentinum, Castrum Vergium. The plural was used as a place name, as Castra Cornelia. 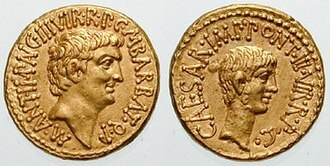 Castrorum Filius was one of names used by the emperor Caligula, the terms stratopedon and phrourion were used by Greek language authors to translate castrum and castellum, respectively. A castrum was designed to house and protect the soldiers, their equipment and this most detailed description that survives about Roman military camps is De Munitionibus Castrorum, a manuscript of 11 pages that dates most probably from the late 1st to early 2nd century AD. Regulations required a major unit in the field to retire to a properly constructed camp every day, to this end a marching column ported the equipment needed to build and stock the camp in a baggage train of wagons and on the backs of the soldiers. They could throw up a camp under enemy attack in as little as a few hours. Judging from the names, they used a repertory of camp plans, selecting the one appropriate to the length of time a legion would spend in it, tertia castra, quarta castra. A camp of three days, four days, more permanent camps were castra stativa, standing camps. The least permanent of these were castra aestiva or aestivalia, summer camps, in which the soldiers were housed sub pellibus or sub tentoriis, under tents. For the winter the soldiers retired to castra hiberna containing barracks and other buildings of solid materials. 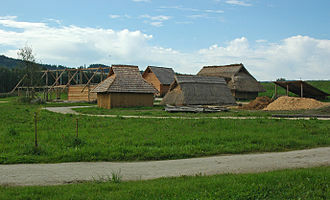 The camp allowed the Romans to keep a rested and supplied army in the field, neither the Celtic nor Germanic armies had this capability, they found it necessary to disperse after only a few days. Victor Amadeus II was Duke of Savoy from 1675 to 1730. He held the titles of marquis of Saluzzo, duke of Montferrat, prince of Piedmont, count of Aosta, Louis XIV organised his marriage in order to maintain French influence in the Duchy but Victor Amadeus soon broke away from the influence of France. Having fought in the War of the Spanish Succession, he became king of Sicily in 1713 but he was forced to exchange this title, Victor Amadeus was born in Turin to Charles Emmanuel II, Duke of Savoy and his second wife Marie Jeanne of Savoy. Named after his paternal grandfather Victor Amadeus I he was their only child, as an infant he was styled as the Prince of Piedmont, traditional title of the heir apparent to the duchy of Savoy. A weak child, his health was greatly monitored, as an infant he had a passion for soldiers and was noted as being very intelligent. His father died in June 1675 Turin at the age of forty after a series of convulsive fevers and his mother was declared Regent of Savoy and Marie Jeanne, known as Madame Royale at court, took power. The duchy would revert to the Kingdom of Portugal at her death. Victor Amadeus refused and a party was formed which refused to recognise his leaving Savoy. Despite a marriage contract being signed between Portugal and Savoy on 15 May 1679, the marriage between Victor Amadeus and the Infanta came to nothing and was thus cancelled, other candidates included Maria Antonia of Austria, a Countess Palatine of Neuburg and Anna Maria Luisa de Medici. Victor Amadeus was keen on the match with Tuscany and negotiations were kept secret from France even though the match never happened, under the influence of Louis XIV and Marie Jeanne, Victor Amadeus was forced to marry a French princess Anne Marie dOrléans. His mother was keen on the match and had always promoted French interests having been born in Paris a member of a branch of the House of Savoy. A significant event of his mothers regency was the Salt Wars of 1680 and these rebellions were caused by the unpopular taxes on salt in all cities in Savoy. Turin is a city and an important business and cultural centre in northern Italy, capital of the Piedmont region and was the first capital city of Italy. The city is located mainly on the bank of the Po River, in front of Susa Valley and surrounded by the western Alpine arch. The population of the city proper is 892,649 while the population of the area is estimated by Eurostat to be 1.7 million inhabitants. The Turin metropolitan area is estimated by the OECD to have a population of 2.2 million, in 1997 a part of the historical center of Torino was inscribed in the World Heritage List under the name Residences of the Royal House of Savoy. Turin is well known for its Renaissance, Rococo, Neo-classical, many of Turins public squares, castles and elegant palazzi such as Palazzo Madama, were built between the 16th and 18th centuries. This was after the capital of the Duchy of Savoy was moved to Turin from Chambery as part of the urban expansion, the city used to be a major European political center. Turin was Italys first capital city in 1861 and home to the House of Savoy, from 1563, it was the capital of the Duchy of Savoy, of the Kingdom of Sardinia ruled by the Royal House of Savoy and finally the first capital of the unified Italy. Turin is sometimes called the cradle of Italian liberty for having been the birthplace and home of notable politicians and people who contributed to the Risorgimento, such as Cavour. The city currently hosts some of Italys best universities, academies and gymnasia, such as the University of Turin, founded in the 15th century, in addition, the city is home to museums such as the Museo Egizio and the Mole Antonelliana. Turins attractions make it one of the worlds top 250 tourist destinations, Turin is ranked third in Italy, after Milan and Rome, for economic strength. With a GDP of $58 billion, Turin is the worlds 78th richest city by purchasing power, as of 2010, the city has been ranked by GaWC as a Gamma World city. Turin is home to much of the Italian automotive industry, the Taurini were an ancient Celto-Ligurian Alpine people, who occupied the upper valley of the Po River, in the center of modern Piedmont. Charlemagne or Charles the Great, numbered Charles I, was the King of the Franks from 768, King of the Lombards from 774 and Emperor of the Romans from 800. 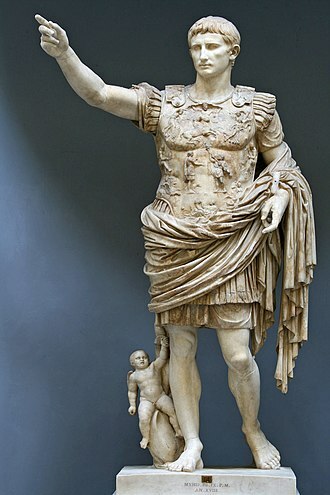 He united much of Europe during the early Middle Ages and he was the first recognised emperor in western Europe since the fall of the Western Roman Empire three centuries earlier. The expanded Frankish state which Charlemagne founded was called the Carolingian Empire, Charlemagne was the oldest son of Pepin the Short and Bertrada of Laon. He became king in 768 following his fathers death, initially as co-ruler with his brother Carloman I, carlomans sudden death in 771 in unexplained circumstances left Charlemagne as the undisputed ruler of the Frankish Kingdom. He continued his fathers policy towards the papacy and became its protector, removing the Lombards from power in northern Italy and he campaigned against the Saxons to his east, Christianising them upon penalty of death and leading to events such as the Massacre of Verden. Charlemagne reached the height of his power in 800 when he was crowned Emperor of the Romans by Pope Leo III on Christmas Day at Old St.
Peters Basilica. Charlemagne has been called the Father of Europe, as he united most of Western Europe for the first time since the Roman Empire and his rule spurred the Carolingian Renaissance, a period of energetic cultural and intellectual activity within the Western Church. 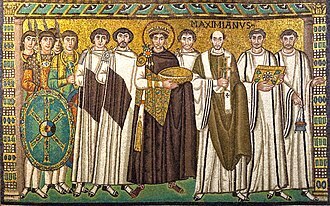 All Holy Roman Emperors considered their kingdoms to be descendants of Charlemagnes empire, up to the last Emperor Francis II and these and other machinations led to the eventual split of Rome and Constantinople in the Great Schism of 1054. Charlemagne died in 814, having ruled as emperor for thirteen years and he was laid to rest in his imperial capital of Aachen in what is today Germany. He married at least four times and had three sons, but only his son Louis the Pious survived to succeed him. By the 6th century, the western Germanic Franks had been Christianised, ruled by the Merovingians, was the most powerful of the kingdoms that succeeded the Western Roman Empire. Following the Battle of Tertry the Merovingians declined into powerlessness, for which they have dubbed the rois fainéants. The Roman circus was a large open-air venue used for public events in the ancient Roman Empire. The circuses were similar to the ancient Greek hippodromes, although circuses served varying purposes and differed in design, along with theatres and amphitheatres, Circuses were one of the main entertainment sites of the time. Circuses were venues for chariot races, horse races, and performances that commemorated important events of the empire were performed there, for events that involved re-enactments of naval battles, the circus was flooded with water. The Circus of Maxentius epitomises the design, the median strip was called the spina and usually featured ornate columns and commemorative obelisks. 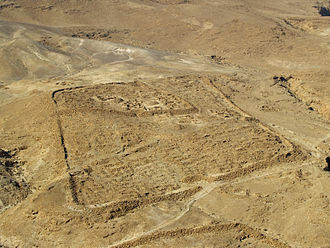 The turning points on either end of the spina were usually marked by conical poles, one circus, that at Antinopolis, displays a distinct gap of some 50m between the carceres and the start of the ascending seating where there is apparently no structure. This appears to be an exception, the great majority of circuses fit the description above. These latter circuses are normally small, and should probably be considered stadiums, there are similar buildings, called stadia, which were used for Greek style athletics. These buildings were similar in design but typically smaller than circuses, however, an example of this type is the Stadium of Domitian. Although circuses such as the Circus Maximus may have existed in form from as early as around 500BC. The comparative dimensions of a circus may be measured in 2 basic ways, by the length of the track, other dimensions, such as the external dimensions of the structure may vary considerably depending on the location, the site, and on specific architectural characteristics. The simplest comparative measurement of a circus is its track length and this is the most easily measured dimension, as it only requires small excavations at either end of the centreline. It is very probable that this can be even when the circus is buried under subsequent constructions. Track lengths may vary from the 245m of the circus at Gerasa, the alternative comparative dimension is that of seating capacity. A cardo was the Latin name given to a north-south street in Ancient Roman cities and military camps as an integral component of city planning. The cardo maximus was the main or central north–south-oriented street, the cardo maximus was the hinge or axis of the city, derived from the same root as cardinal and as such was generally lined with shops and vendors, and served as a hub of economic life. Most Roman cities had a Decumanus Maximus, an east-west street that served as a main street. Due to varying geography, in cities the Decumanus is the main street and the Cardo is secondary. The Forum was normally located at, or close to, the intersection of the Decumanus, the thoroughfare was about 1.85 kilometres long and 37 metres wide, as it was used for wheeled transport. The great colonnade was erected in the 2nd century and it was standing until the 12th. The earthquakes of 1157 and 1170 demolished the colonnade, the cardo was lined on both sides with civic and religious buildings. The excavations at Jerash in Jordan have unearthed the remains of an ancient Roman city on the site, hohe Strasse and Schildergasse in Cologne, Germany may be taken as examples of streets that have kept their course and function of Cardo and Decumanus Maximus until this day. 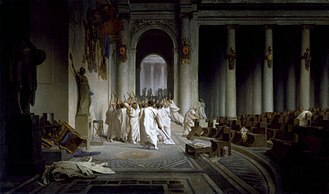 After the Jewish rebellion led by Simon Bar Kokhba was crushed by Hadrian in the 130s AD, Hadrian built a Roman colony in its place, naming it Colonia Aelia Capitolina, after the Roman deities Jupiter and Minerva, worshiped at the Capitoline Hill temple in Rome. Like many Roman colonies, Aelia Capitolina was laid out with a Hippodamian grid plan of narrower streets and wider avenues. The southern addition to the Cardo, constructed under Justinian in the 6th century AD, along its length, the roadway was divided into three parts, two colonnaded covered walks flanking a 12 meter wide road. The central open pavement provided commercial access as well as ritual space, the Cardo’s most striking visual feature was its colonnade, clearly depicted on the Madaba Map. Simple bases supported monolithic shafts, spaced 5.77 meters apart, the shafts supported Byzantine-style Corinthian capitals – intricately carved, but more stylized versions of their Classical counterparts. Although this combination of elements was uniform the preserved examples display some variation in the profile and size of the bases, and in the pattern of the capitals. 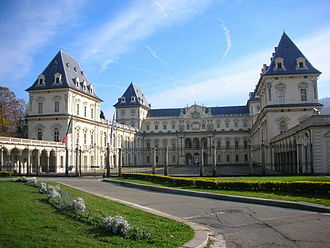 Palazzo Madama e Casaforte degli Acaja is a palace in Turin, northern Italy. It was the first Senate of the Italian Kingdom, and takes its name from the embellishments it received under two queens of the House of Savoy. At the beginning of the first century BC, the site of the palace was occupied by a gate in the Roman walls from which the decumanus maximus of Augusta Taurinorum departed, two of the towers, although restored, still testify to this original nucleus. After the fall of the Western Roman Empire, the gate was used as a stronghold in the defences of the city. Later the building became a possession of the Savoia-Acaja, a branch of the House of Savoy, in the early 14th century. A century Ludovico of Acaja rebuilt it in shape, with an inner court and a portico. The form of this edifice is still recognizable from the back section of the palace. After the extinction of the Acajas, the became a residence for guests of the house of Savoy. In 1637 the regent for Duke Charles Emmanuel II, Christine Marie of France and she commissioned the covering of the court and a revamping of the inner apartments. Sixty years another regent, Marie Jeanne of Savoy, who was known as Madama Reale and she conferred upon it definitively the nickname of Madama. She invited many artists to renovate the building which the duchess wanted to turn into a royal palace. The duchess asked architect Filippo Juvarra to design a new Baroque palace in white stone, the palace had various uses, and housed the headquarters of the provisional French government during the Napoleonic Wars. In the 19th century King Charles Albert selected it as seat of the Pinacoteca Regia, the art gallery. Since 1934 it has housed to the City Museum of Ancient Art, overlooking Piazza Castello, the section built by Juvarra constitutes today a scenographic façade a single bay deep, screening the rear part of the edifice, which has remained unchanged. Each pilaster stands on a sturdy and formal fielded channel-rusticated base against the masonry of the ground floor. Their prominence is emphasised by the tall socles on which they stand, on either side the bays windows are set together within a slightly recessed panel, thus there are three layered planes to the façade. The Porta Nigra Roman city gate in Trier, Germany. Today a World Heritage Site. The Holstentor is a medieval city gate of the Hanseatic city of Lübeck and today a World Heritage Site. The city walls of Jaisalmer, India, also known as Jaisalmer Fort due to its size and complexity in comparison to other city walls. It is a UNESCO World Heritage Site and is considered one of the largest and best preserved city walls, along with its Medieval Indian town, where many of the stone-carved buildings have not changed since the 12th century. 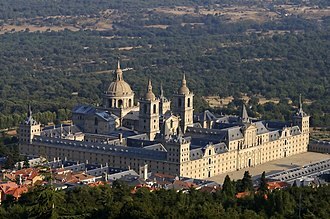 The Royal Site of San Lorenzo de El Escorial, in Spain, is a renacentist complex that has functioned as a royal palace, monastery, basilica, pantheon, library, museum, university and hospital. Interior of the Colosseum amphitheatre in Rome, built c. 70 – 80 CE, considered one of the greatest works of architecture and engineering. Arles Amphitheatre, France: a Roman arena still used for bullfighting, plays and summer concerts. The rear area, still bearing the 15th-century appearance of a castle. Stone piers atop brick footings stand out of the excavated Roman stratum. Rossgraben bridge (Rüeggisberg) near Bern, Switzerland, showing the hinge at mid-span of this three-hinged arch. 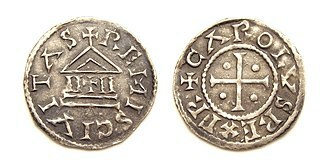 Denier (type Temple and cross) of Charles the Bald, minted at Reims between 840-864 (pre-Edict of Pistres). Floorplan of Circus Maximus. This design is typical of Roman circuses. Full-length image of the Turin Shroud before the 2002 restoration. Secondo Pia's 1898 negative of the image on the Shroud of Turin has an appearance suggesting a positive image. It is used as part of the devotion to the Holy Face of Jesus. 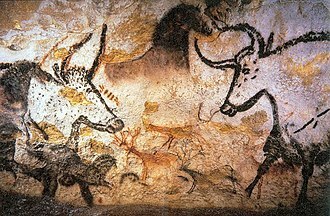 Image from Musée de l'Élysée, Lausanne. The pilgrim medallion of Lirey (before 1453), drawing by Arthur Forgeais, 1865. A poster advertising the 1898 exhibition of the shroud in Turin. Secondo Pia's photograph was taken a few weeks too late to be included in the poster. The image on the poster includes a painted face, not obtained from Pia's photograph. Outside view from the West, with domes, portico, column, and belltower. Altar with icon of the Virgin of the Consolation. A 19th-century stereoscopic photograph showing the Mole with a temporary dome. 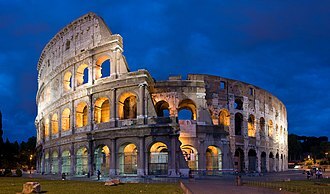 The most enduring landmark of the Flavian dynasty was the Flavian Amphitheatre, better known as the Colosseum (in Italian Colosseo). Its construction was begun by Vespasian, and ultimately finished by Titus and Domitian, financed from the spoils of the destruction of the Second Jerusalem Temple. 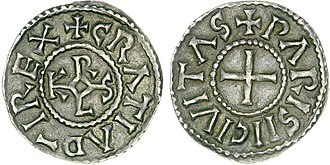 Carolingian denier of Lothair I, struck in Dorestad (Middle Francia) after 850. His wife Anne Marie d'Orléans. A cutaway drawing of the palace. The 19th century rear façade of the Palazzo Carignano on Piazza Carlo Alberto.